MILAN - Very rare photo of Liam driving but making a not rare gesture :). 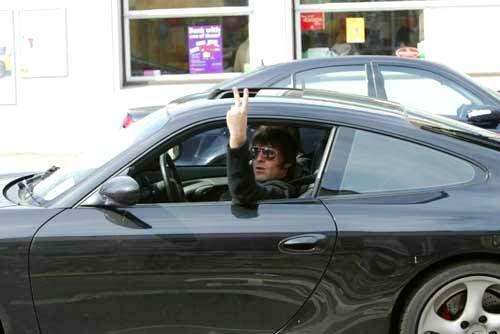 We thought the new Beady Eye could perform @ Formula One rocks Milan, as Stereophonics last year @ Milan Alcatraz disco, also because their "speeding" album about cars was appropriate. In their place: the left wing pacifist Jamiroquai... and not even in Milan, but @ Monza stadium. I used to like Jay Kay in the '90s, he's English, from Manchester and big fan of cars, but I can't see where he "rocks"... Besides he supports Ferrari, I like him even less now. Very disappointing.